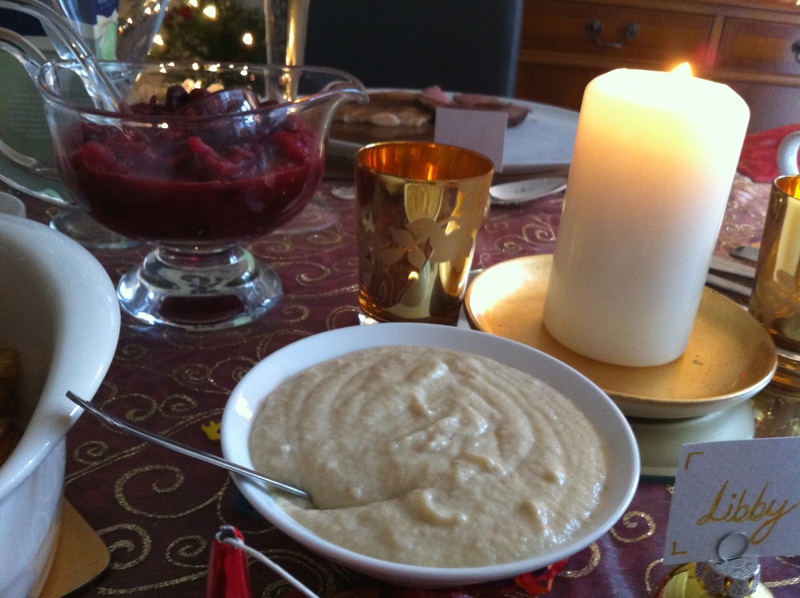 This is just a fun little post, I wanted to show you what we had for our Christmas dinner this year 🙂 I’m very strict in my Christmas traditions, it has to be the same every year. Exactly the same! I still live at home but my brother has moved out and he comes home every Christmas and we all spend the day together. We don’t have anyone else over; just the core four! We open all our presents in the morning and then sit down for lunch about 1pm…by which time we’ve all had a drink or 4 and feeling generally quite jolly. 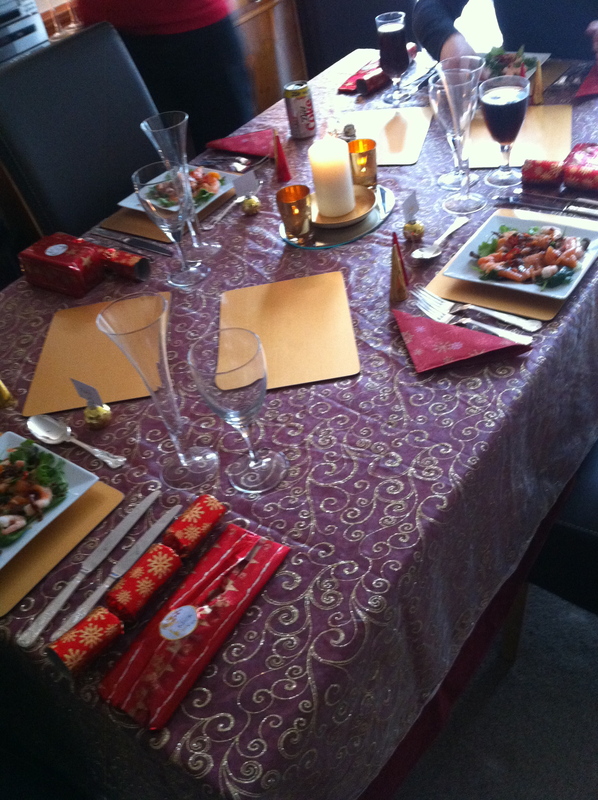 This was this years beautiful table setting, expertly laid by my Mum to include party poppers, placenames, candles and crackers. 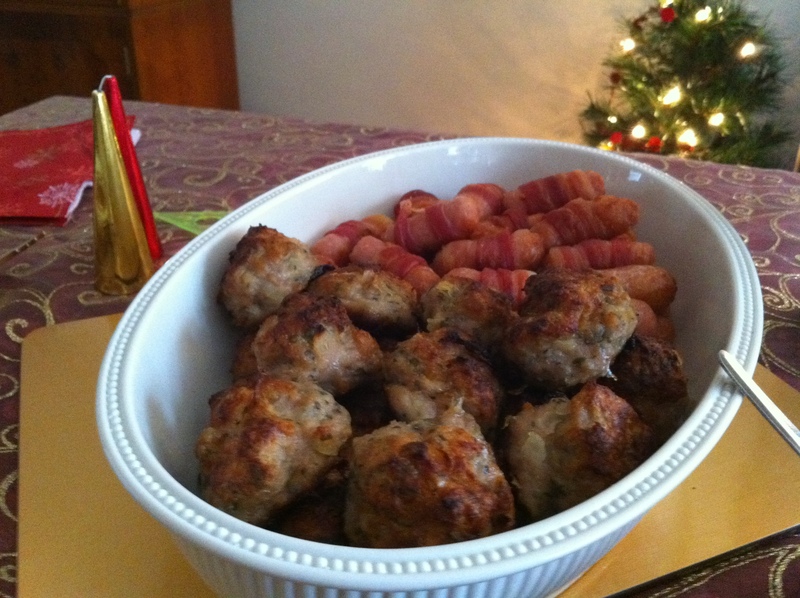 Our starter is always the same, cooked and assembled by Head Chef AKA Dad. We have beautiful smoked salmon and king prawns over lettuce, with a lovely zingy lime and chilli dressing and crispy bacon bits on top. This years dressing was a bit of an experiment as my Dad said he’d added quite a bit more chilli than usual. As we were eating, he tentatively asked for our opinions. I personally was a big fan, the chilli gave the whole dish a great kick but my Mum and brother were not quite as sure. We’ll have to see what becomes of the dressing in 2012! After a pleasant break in which we received our first “table present” (a tradition carried on from our childhood which cheered us up immensely remembering that after all our main presents were opened we would still have these to come) the various dishes which made up the main event started appearing on the table. 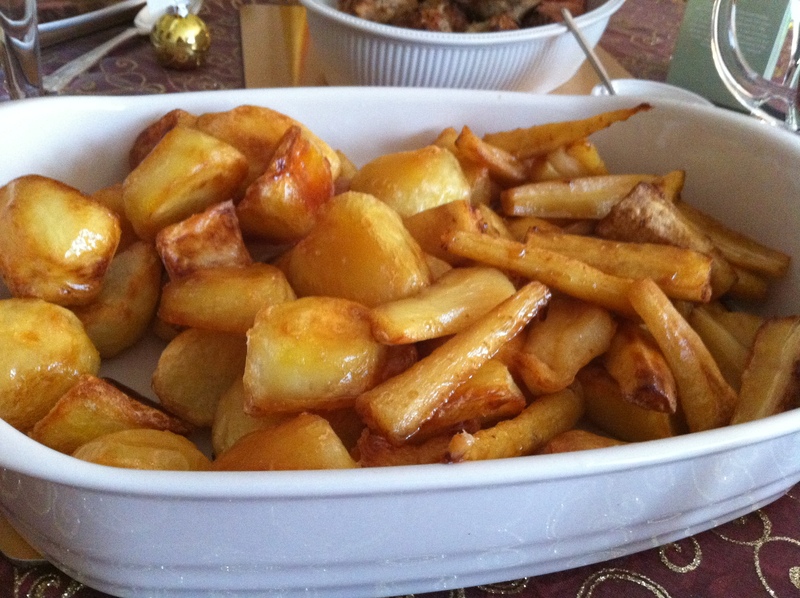 Perfectly roasted potatoes and parsnips. Homemade bread and cranberry sauces! 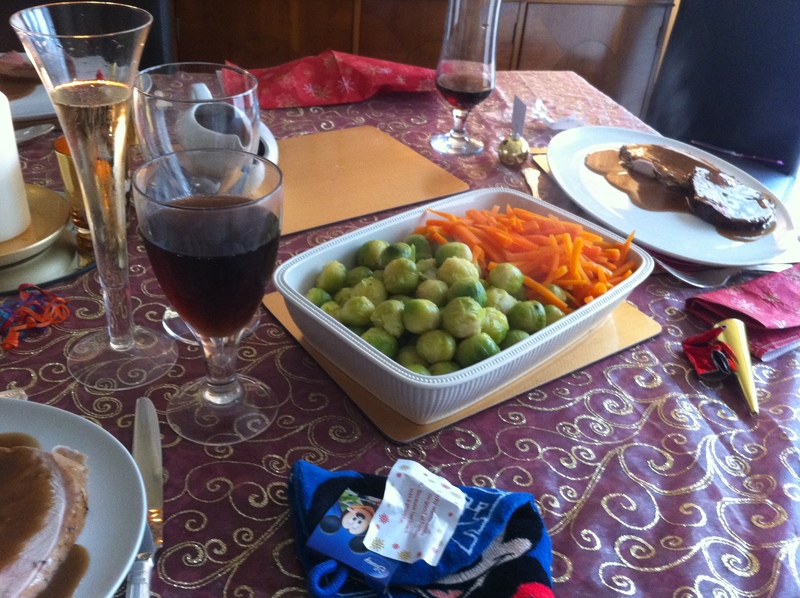 Carrots and Brussel sprouts…not my favourite but unfortunately a vital component of Christmas lunch. I forced down a couple…well maybe only one…half. 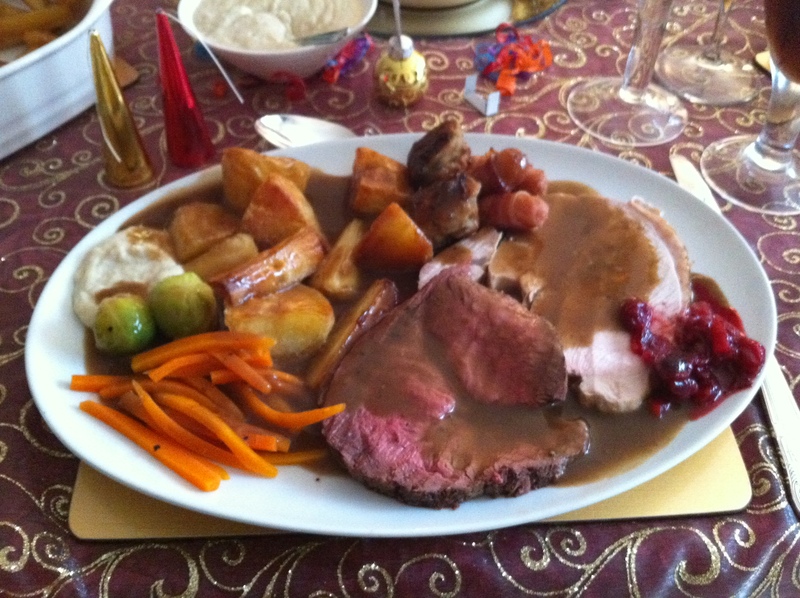 My plate, laden with meat, awaiting the onslaught of accompaniments! And here, in all it’s glory, is my finished plate. We actually got new plates this year which was quite exciting, lovely big white ones which eliminate the age-old problem of overcrowding. Unfortunately my eyes were slightly bigger than my belly and as much as I tried, I was only able to eat about 3/4. Still a pretty good effort I think but very difficult to come to terms with at the time. 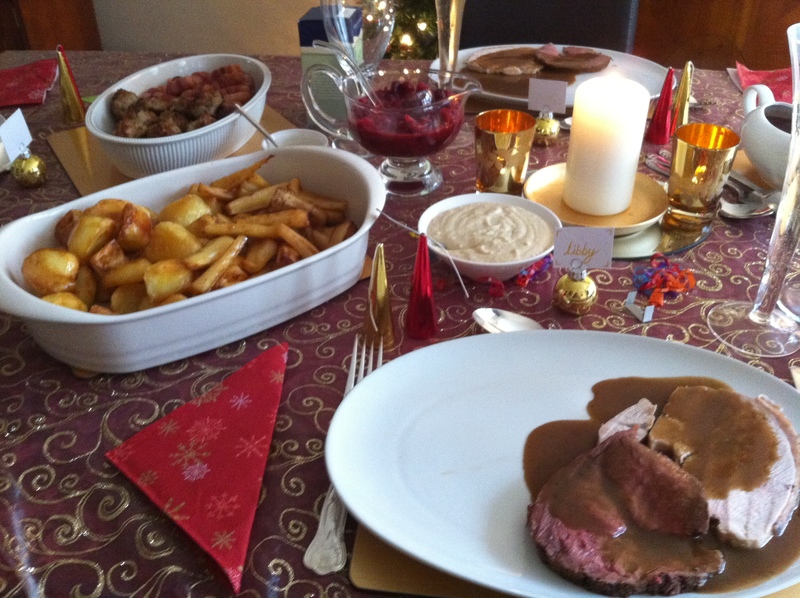 My favourites were the gorgeous roast potatoes and my Mums homemade cranberry sauce. I was so stuffed that I couldn’t even contemplate dessert, opting instead for a couple of soothing glasses of delicious, creamy Baileys. A perfect ending to a perfect lunch and another successful Morgan Family Christmas! Looks gorgeous! I may join you next year!